As I stepped off the airplane, I knew I was entering a different stage of my life. A phase where I would start to breathe differently, perceive differently, live differently. Sarah and I had traveled from Chicago together and arrived right after midnight on New Year’s Eve, ready to welco me the New Year in a place that for ages has tickled our senses from afar. Now we were finally able to discover the cultural fabric of India in a way that means so much to both of us: through dance, cultural immersion, and service. The first few days gave me a chance to sink into the time change, cultural differences, and metropolitan environment of Mumbai. I usually find myself adapting to environments relatively easily, but India was different. It challenged me. And that’s why I have fallen in love with it. Upon reflection, I realize that the majority of my travels have been to Spanish-speaking countries, my second native language. This is the first country where I have not been able to communicate linguistically, all the more reason to rely on one of my principal ideologies that movement is, in fact, a universal language. Gestures, eye gazes, facial expressions are all means of communication that, in India, I have grown more inclined to notice. Welcoming in the New Year in Khandala. We spent New Years Eve with a group of friends in Khandala, considered a nature-filled refuge for city dwellers about an hour outside of Mumbai. There, I set a theme for the year of 2015: Exploration. This entails exploring people, places, concepts, activities, and other qualities of life that are external. This will also give way to exploring my own thoughts, values, spirituality, reactions, and other integral parts of my inner self. So far, this has given clarity to my actions and it’s so refreshing to see how each action is interrelated through one simple theme. As framed in the Mani Bhavan Gandhi Museum. Two days before the exchange commenced, Hannah, Sarah, and I, who had all arrived a little earlier than other participants, decided to explore the city a bit more. We saw the Haji Ali, an architectural masterpiece with a walkway in the middle of the Arabian Sea, the Gandhi museum, and the Queen’s Necklace. We learned about political parties, economic disparity, and how India’s many religions have shaped the demeanor of its people. It is a place of true unity within diversity. A day before our exchange began, we visited the Gateway of India in South Mumbai and the Elephanta Caves, situated on an island off the coast of Mumbai. On the boat ride over I made friends with a woman from Bhutan and a woman from Northern India, to the point that they asked me to be their daughter-in-law, how flattering! Goes to show the connection you can make over a short half hour. 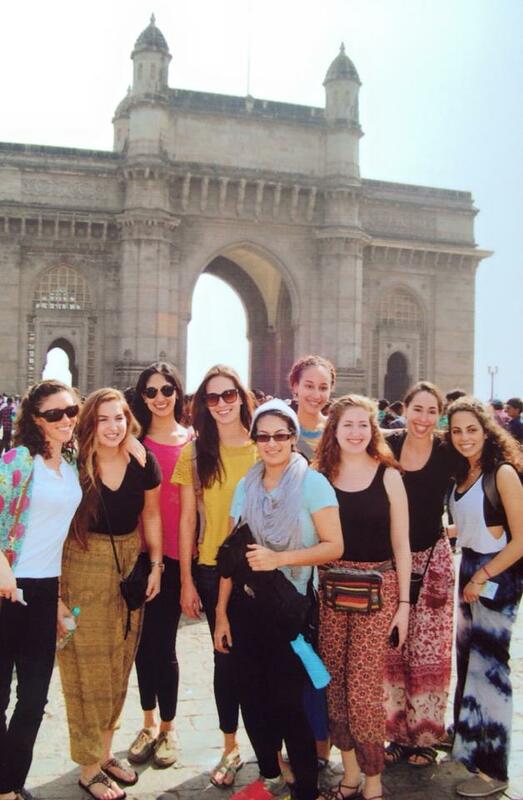 Pictured at the Gateway of India in Mumbai. A few days later, we began our service at the Society of Education for the Crippled. Initially, we were all a bit apprehensive to teach dance to the kids given their physical conditions, but after morning preparation and discussion, we felt ready to make a difference. Upon walking into the school we were greeted by a chorus of loud cheers, applause, and smiles. We immediately felt more than welcome and their ecstatic response was infectious. After our first workshop at SEC. We led a few very simple exercises that emphasized the joy of movement and what the kids were able to do versus unable. Why? Too often the kids go through life noticing the negative in their movement, and for one week they felt the positive that could come from it. Over the course of the week we saw the happiest kids we’ve ever seen. It seemed as though the limitations that held their body down was relinquished. In essence, they were open to any and all movement, thirsting for a chance to express through their bodies. A typical class with them consisted of a warm-up exercise, such as passing a balloon around the circle, teaching a routine to popular Hindi songs or storytelling through movement, then playing a game that focused on awareness of body parts and their individual movements. I mainly led partner choreography to emphasize the importance of interpersonal contact between the kids. By the end of the week, we found ourselves knowing quite a few Hindi basics and we even had a wrap-up meeting with the staff at SEC. Discussion with the wonderful teachers at SEC. One of our other service activities was with kids that have been learning to play cricket with our Program Director’s uncle. They are mainly from surrounding slum areas in Mumbai and come to the cricket field every day to learn from Tony Mama, their coach. He opened up his and their time to us to have a true exchange of movement. We taught them dance and they taught us how to play cricket. We were all on the same level of learning and teaching. If that’s not youth empowerment then I don’t know what is. We wish them the best of luck in all their cricket endeavors. The kids teaching me how to play cricket. The other half of our time was spent teaching at Sumeet Nagdev’s Dance Arts Studio for his Dance of Giving Week. We all had three individual classes, which ranged from ballet to Afro-Modern. I taught Flamenco Contemporary, Afro-Brazilian/Samba, and Movement Exploration. The latter was the most liberating experience I’ve ever had. I told participants that I was merely handing them a frame and they were to paint their own experience. The creativity that spawned from the class was immense and I’m itching to experiment more with teaching this type of structured improvisation. I was impressed not only by the open-mindedness carried by each participant, but also the diversity of the community. There were about 1/3 first time dancers and more than half had just started dancing. Nonetheless, each and every one of them put their heart and soul into understanding and exploring movement, which spirals back to my theme for this year: exploration. They all inspired me beyond belief. The “Dance of Giving” Week at Sumeet Nagdev’s Dance Academy. It was heart-wrenching to leave Mumbai after just one week. For one, it meant that Hannah, a fellow participant and amazing friend, was leaving us due to commitments made to perform back home. It also meant parting ways with the people that made our experience in Mumbai so fruitful. And above all, it meant saying goodbye for now to the kids that we worked with, which is always a difficult thing to do. The bright side is that this week has enriched and enlivened them as much as, if not more than, us. As my dear friend and colleague Mei-Ling, would say, you don’t choose India, India chooses you. And as we begin a new chapter of our exchange on the opposite side of India, in Kolkata, this concept continues to develop in my mind and makes more and more sense each day.